It was 1 p.m. on the dot when the line began to grow in size. Filling elevators and stairwells, students made their way to the third floor of the Adanti Student Center, waiting to get into the ballroom. Southern Connecticut State University hosted its bi-annual Clubs and Organizations Involvement Fair Jan. 14, where students could explore all of the different campus recreational activities and club options. Each semester, the campus organizations come together with displays and flyers to promote their groups with big turnouts, and this year was no exception. 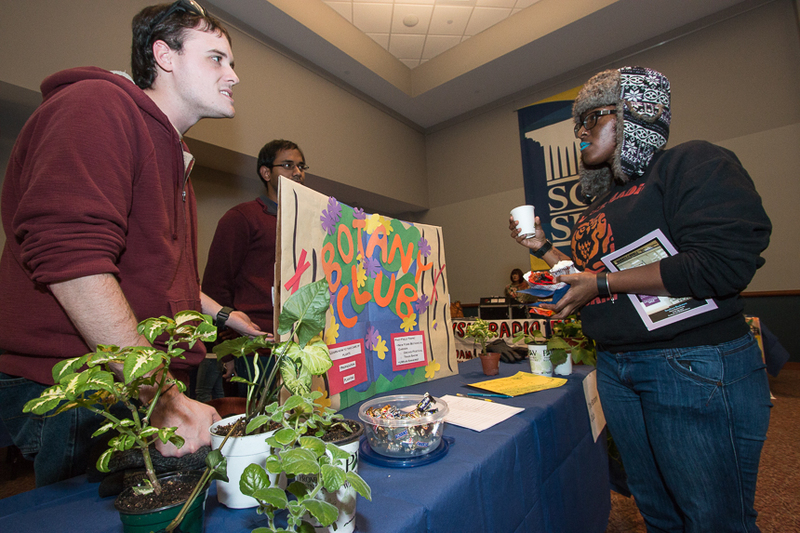 Students attended the fair in hopes of finding a place that suited their interests. Senior Danielle McDonald hoped to find an activity to participate in for her final year here at Southern. The Club Fair was a part of the Week of Welcome activities, intended to welcome new students to campus. Outside of the ballroom, students lined up at the welcome desk with student ID cards in hand. In order to go inside, either as a part of an organization or an inquiring student, a swipe of the hoot loot was needed. The area was full of Southern Pride. Right in the lobby area, Blue Crew invited students to take pictures and learn more about how to join. Walking into the ballroom, blue and white tables filled the area. Student Government Association, commonly referred to as SGA, was one of the tables at the front greeting new students and prospecting new members. “We voice all student opinions and we’re here to help all students,” said Chris Soares, board of finance chair for SGA. The organization will meet Fridays in Engelman B121 at 1 p.m., which wasn’t rare. Most organizations announced that their meetings would be at 1 p.m. on Mondays, Wednesdays or Fridays due to that being community hour, the one time that students don’t typically have classes. Posted against the left and right walls were the campus Greek organizations. Alpha Sigma Alpha, Tau Kappa Epsilon and Lambda Alpha Upsilon, just to name a few, were in all in attendance. Those interested in joining the Southern’s Greek organizations were invited to the Greek Showcase Thursday at 7 p.m. in the ballroom. The middle of the room was filled with social justice and equality organizations. Towards the center right were some of the many multi-cultural organizations, such as the Organization of Latin American Students (OLAS), Southern’s chapter of the National Association for the Advancement of Colored People, or NAACP for short and African Students Association. “Our goal is to show the different cultures of Africa so people can know that not all Africans are the same,” said Hajara Isnail. With a flyer in hand, she announced upcoming events and invited those interested in dance to attend African Dance tryouts for Jan. 16 at 6 p.m. in the ballroom. “In NAACP, we try to promote equality and community service,” said Jess Fort, VP. “We try to go out into the community every Sunday,” where she said they would make visits out to local elementary school or nursing homes. Many of the organizations on campus are active in community service and getting involved in the community. The Service Commission, Best Buddies, Active Minds and Operation Smile all presented displays of how their organizations helped others. The Operation Smile organization showed pictures of young children with cleft lips or cleft palates and told students that by attending some of their bake sales or running in the 5k races, funds would be raised to help some of the children. Active Minds let people write or take notes of encouragement. Students walked around looking for clubs that piqued their interest, whether they liked to dance, serve their community or participate in the campus radio station. “I need something to do,” student Noelle Gmitter said.